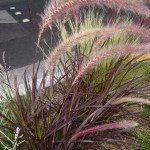 I know fertilizer isn't always necessary to promote growth of purple fountain grass, but if I were to fertilize, what would you recommend? 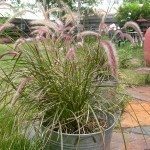 A relatively small amount of balanced natural fertilizer (for plants, not grass) in the spring is all they need to grow. In fact, compost should be fine. Only give them additional fertilizer if leaves appear yellow and sparse. Adding additional phosphorus (like bone meal) can help if the plant fails to produce plumes.